The perfect combination of style and durable design, this beautiful full back bar stool from !nspire makes a terrific addition to any kitchen counter or breakfast island. You'll appreciate how well its contemporary design fits into any room in your home. Its stunning coloured base frame is surprisingly easy to match with other decor. Comfort meets classic styling in the elegant Avery barstool. The seat of this sturdy 29-inch barstool is covered with a neutral beige fabric and rests on a dark rubber wood frame that will effortlessly complement a wide variety of interiors. A detailed nail-head trim adds a timeless visual accent while also reinforcing the seams of the durable 100% polyester fabric. This comfortable upholstered barstool is a stylish accent for a bar or a kitchen island, and the webbing seat structure of this chair ensures it will stand up to regular use with ease. Complete the look of your dining or home-entertaining space with several of these versatile chairs. Milan Patio Stool in Teak The Eon Milan Counter Height Dining set truly delivers lasting natural beauty. Crafted from an innovative all-season resin that boasts incredible fading and weathering performance, Eon's premium products maintain their beautiful, natural wood-like appearance over their very long lives. Eon technology eliminates the frustrations associated with sanding, staining and painting. Eon is one of the finest alternatives to wood available on the market today. This beautiful Milan ensemble is comfortable and durable, and designed for easy assembly. The dining table measure 40" square and includes an umbrella hole. 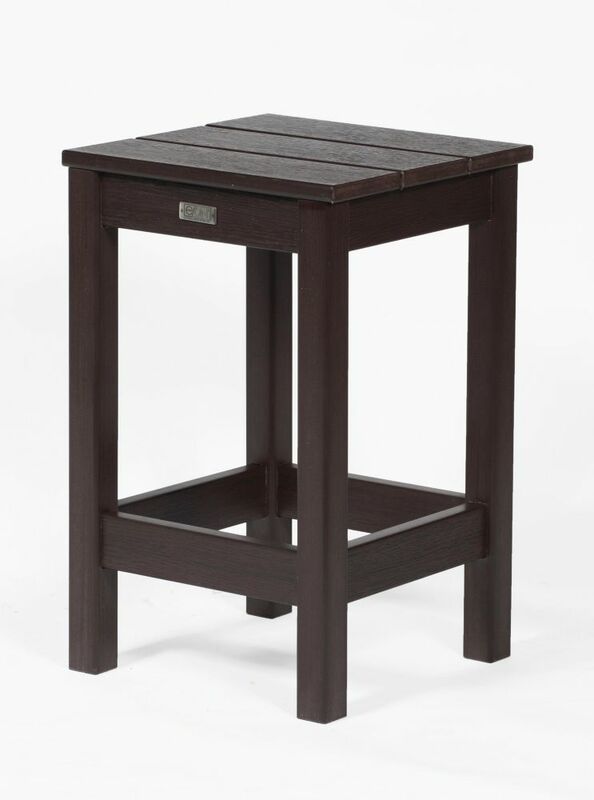 The stools are available in both Teak and Espresso finishes and are exceptionally strong. Counter Height dining seat height is in between a regular dining chair and bar height dining, therefore allowing for very easy access and exit. The Milan Counter height dining set is great for balconies, decks and terraces when the view is the main attraction!